Base Code - Here is competition base code in the form of an Eclipse Java project that includes a GUI for play, a model of the game state, and a rudimentary solver (easily improvable). This is intended as a starting point; feel free to port to other languages, extend, modify, etc. as your curiosity leads you! Research challenge teams should have at least one undergraduate student and at least one faculty mentor. Interested teams should contact Todd Neller. Resources for learning more about machine learning and related column. Setup: Deal cards singly, face-up into a grid (e.g. 4-by-4). the same or adjacent ranks. 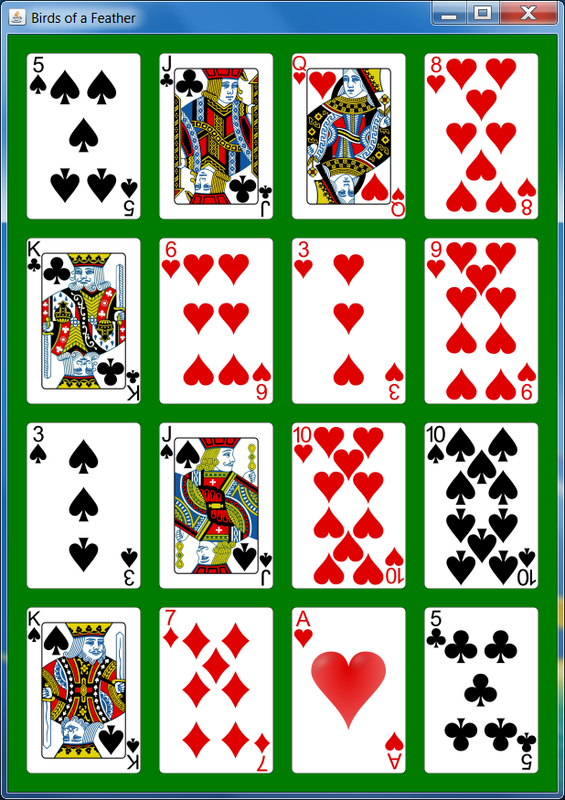 Aces are low and not adjacent to kings, so rank adjacency is according the ordering A, 2, 3, …, J, Q, K.
Eclipse Java project for playing and solving Birds of a Feather puzzles. This is not highly optimized. Rather, it is intended as a starting point for exploration.